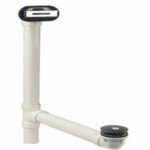 An option that provides and entirely different appearance than the standard round overflow cover. The horizontal overflow provides bather with several more inches of water to soak in. Pipes and are brass and the drain stopper is a touch and push type.